For those masculine types that want their foods to proclaim their Royal man status, there is no shortage of KING Salmon and KING Crab on the menus of Disney’s seafood restaurants. And KINGfisher lager can be had at the Animal Kingdom’s Yak & Yeti. 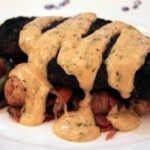 PRINCE Edward Island mussels are available at Yak & Yeti and The Wave. Of course there’s an infinite supply of stereotypical he-man steak and potatoes offered at the Disney steakhouses such as Le Cellier, the Yachtsman Steakhouse, and Shula’s; or the Orlando Waldorf Astoria Bull & Bear. 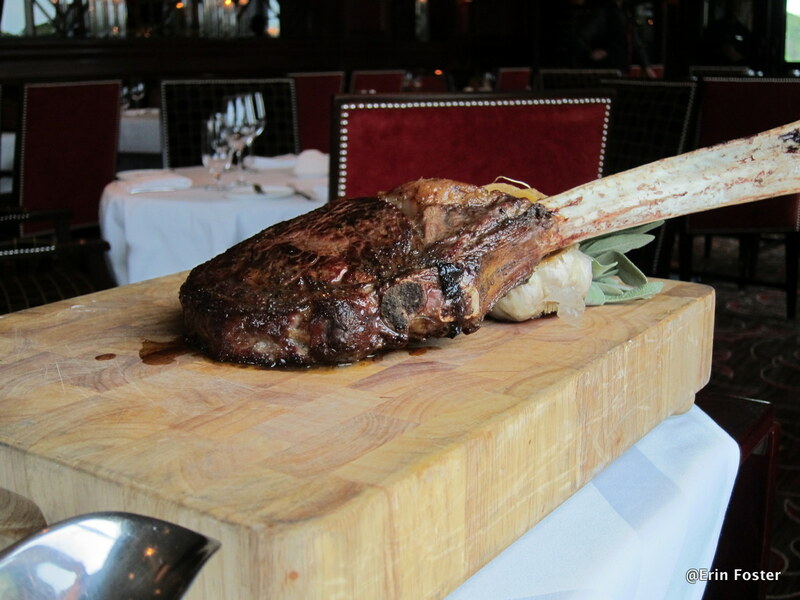 Man-sized meat at the Bull & Bear restaurant at the Disney Waldorf Astoria. You can also find limitless burgers and fries (the budget form of meat and potatoes) sold nearly everywhere. And the ESPN Club is a man cave writ large, so anything proffered there comes with a side of extra machismo. Should little girls be allowed to eat such manly fare? I suppose we can’t forget the manly art of drinking. For men who want to whet their whistles, Walt Disney World is awash with beer and spirits tastings. 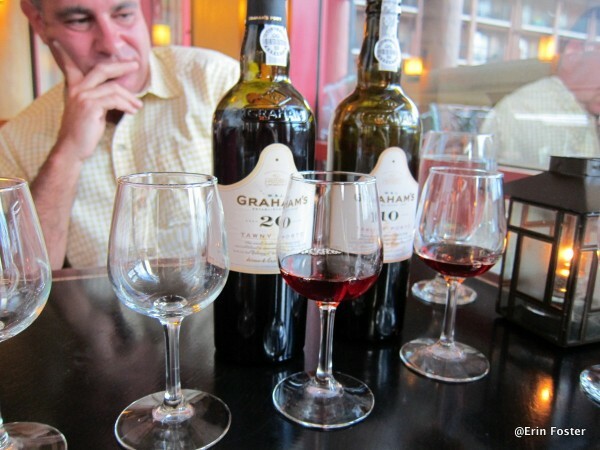 Manly consideration of manly beverages, a port tasting at Artist Point. But gentle readers, I am of the female persuasion, lacking first hand knowledge of the foodie needs of men. I need some help from the virile manfolk and educated womenfolk of the realm. 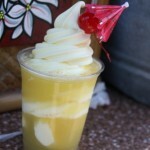 Do you have any tips or suggestions for “manly” dining at Walt Disney World? Let us know in the comments below. As a man, I can give you my suggestion of what I want in food: Large portions of tasty at the cheapest prices. 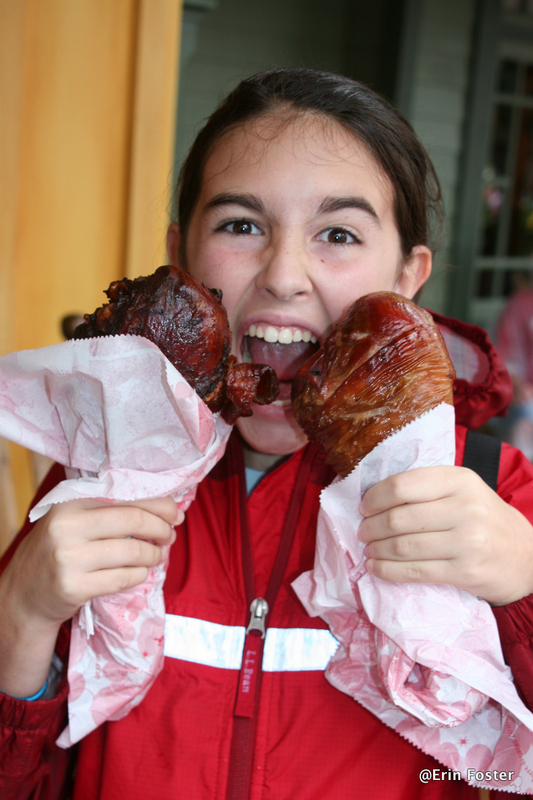 Of course, the Turkey Legs are what everyone immediately thinks of, but there are some other good “man-sized” portions around the World. For example, at Magic Kingdom, Sleepy Hollow’s waffle sandwiches are to die for, and they’re gigantic enough to feed a hungry dude for seven bucks. Or, at Epcot, you can hop into the Pub in UK to get an English Bulldog (an English banger on a bun, piled high with bacon, mashed taters, cheddar cheese and brown mustard), which comes with authentic British chips for only $7.50. Another great place in Epcot is the Lotus Blossom cafe in China, where you can get a huge (really, really huge) bowl of beef noodle soup that can easily feed two or three people (or one big guy like me) for only $8.50. And at Animal Kingdom (since I’m on a roll here), the Flame Tree BBQ has a combo platter of ribs and chicken with baked beans and coleslaw. It’s huge. It’s tasty. It’s only eleven bucks. Not bad for great BBQ. 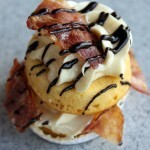 And to finish it all off for dessert, get a big ole manly cupcake at Starring Roles Cafe. For only four dollars, I suggest either the Butterfinger cupcake or (my personal favorite) the chocolate peanut butter cupcake. Men really don’t care if their food is labeled “manly” or “for dudes only”, it just has to be big, tasty and cheap. Of course, I’m just following my gut, but isn’t that the point? LOL! I’ll have to tell my husband about these recommendations. 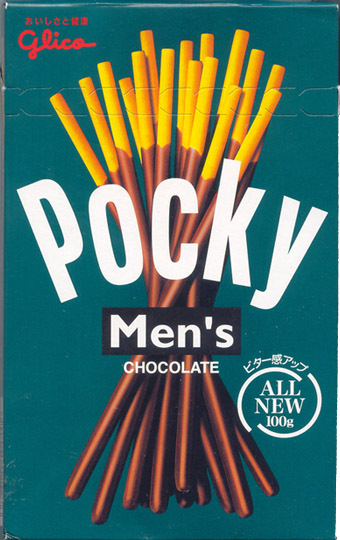 Also still need to try that Pocky for Men! You may wish to ignore me because I have no specific WDW comments, other than to say the two gentleman’s teas are very accurate to older sensibilities concerning gender and food, a sort of food “segregation” that started in the Victorian era and continued until the mid-20th century, at least among many of the middle and upper classes in Britain. Sweets were for children, and women were, unfortunately in the prejudiced thinking of the day, often classified as children. 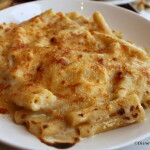 Many men affected, and probably really did develop, a preference for savory tastes (what is classed today as “umami”). Formal dinners often included a savory course at the end of the meal, sometimes in place of dessert (such as slow-scrambled eggs served with anchovies over toast–Scotch Woodcock). There is a great story of the late Queen Mother reverting to the older-style dinner on one occasion, upon which her equerry at dessert took a too-large helping of what he thought was chocolate mousse, only to discover that he faced a huge bowl of liver pate! In a related situation, actual rooms were thought to be masculine or feminine and were decorated accordingly. Immediately after the meal, men remained in the dining room for port and cigars, so dining rooms were decorated to be masculine (heavier, darker furnishings); women withdrew to the drawing room after dinner, and such rooms were decorated in what was considered a lighter, more feminine (often French) style (see: Downton Abbey). The whole thing flies in the face of our modern sensibilities of equality, but it is a fascinating cultural phenomenon, this notion of proper food for manly men! Professor – Great history lesson! I do love watching period pieces like Downton Abbey to see how much tastes have changed. Also, I learned a new word: “equerry.” Thanks! @Will has all the basics down and some great suggestions. I would add the new pork shank to his list. What about the sandwiches from the Earl of Sandwich? 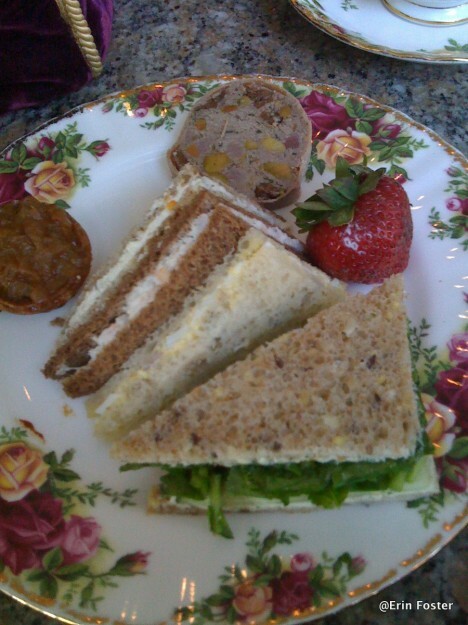 The sandwich was created by the Earl to enjoy a meal in a convenient way whilst not interrupting his card game. As a woman I struggle to finish these huge things. I just wish there were more of them in the UK. Not food, but I convinced my husband to join me at the GF Spa only because they offered a specific “gentleman’s facial” which seemed a bit more acceptable to him than all the other spa treatments. We started with a couples massage. It was incredible, and now we always do a Disney Spa day when we’re there. If not for the “gentleman’s” offering, I’m pretty sure he would have skipped it. Depending on the CM who serves you, if you order beer at Biergarten they may ask you if you want the ladies’ size (half-liter) or the German size (liter). ‘Ohana is sure to be man pleasing as platter after platter of salad, bread, noodles, vegetables, and dumplings are all served family style. Then come the sizzling skewers of beef, shrimp, pork, and chicken flame grilled while you watch. Add to all that, bread pudding served with sweet sauce for dessert and if you time it right you can even watch Wishes fireworks while you dine! I thought that the decoration at Brown Derby had a manly quality of dark lighting with leather, brass and woods. Shula’s is similarly dark and woody, but even I find the football decor a bit much. And some men just want to belly up to a bar while the family plays, so there are a multitude of those available if you’re so inclined.